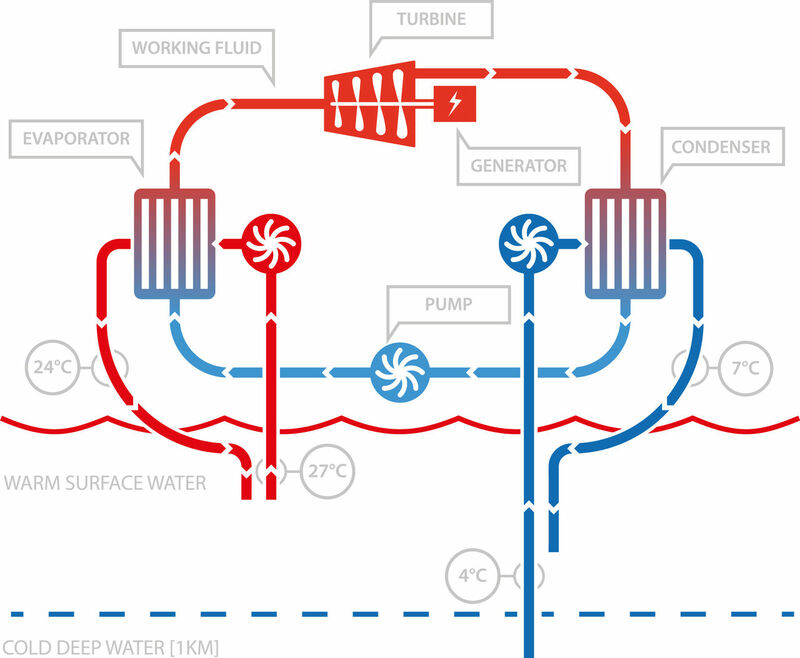 Ocean Thermal Energy Conversion (OTEC) is a renewable energy technology that uses the natural temperature difference in oceans to produce clean, reliable electricity, day and night, year-round. The heat from the warm ocean surface and cold from the deep ocean drives a Rankine Cycle, which produces electricity. Interesting areas for OTEC are in the tropical, equatorial zone, where the ocean temperature difference is highest. OTEC, with its baseload '24/7' generation capabilities and its vast potential, has the potential to become one of the leading renewable energy sources. Delft University of Technology conducts research to develop innovative solutions for OTEC. Today's ongoing research at Delft University of Technology is focussed on the main engineering challenges, related to the process, electrical and offshore equipment, and aims to accelerate the commercialization of OTEC. Seventy percent of all sunlight received by the Earth shines on the oceans. The larger part of this sunlight is captured as heat in the upper layers of the oceans. Therefore, the oceans are by far the biggest solar collectors on Earth. If we could utilize a mere fraction of this energy, we would have a limitless, renewable, baseload source that can provide enough energy to cover our global energy need. Various parties estimate the amount of energy that can be practically harvested to be in the order of 3 to 5 terawatts, without affecting the temperature of the ocean or the world's environment. That’s about twice the global electricity demand. The oceans are thus a vast renewable resource. The technology is viable primarily in equatorial areas where the year-round temperature differential is at least 20 degrees Celsius.Next to producing electricity, OTEC also offers the possibility of co-generating other products, like efficient seawater air-conditioning (SWAC), fresh water and nutrients for enhanced fish farming and algae production. OTEC uses the ocean's warm surface water with a temperature of around 25°C to vaporize a working fluid, which has a low-boiling point, such as ammonia. The vapor expands and spins a turbine coupled to a generator to produce electricity. The vapour is then cooled by seawater that has been pumped from the deeper ocean layer, where the temperature is about 5°C. That condenses the working fluid back into a liquid, so it can be reused. This is a continuous electricity generating cycle. The efficiency of the cycle is strongly determined by the temperature differential. The bigger the temperature difference, the higher the efficiency. The technology is therefore viable primarily in equatorial areas where the year-round temperature differential is at least 20°C. Delft University of Technology conducts research focussed on the main engineering challenges, related to the process, electrical and offshore equipment. Below are some example activities. Thermodynamic analysis, optimization and validation of the OTEC power cycle. The research consists of modelling and experimental verification of the main operating parameters using advanced software and a small-scale research and demonstration prototype of an OTEC power plant. 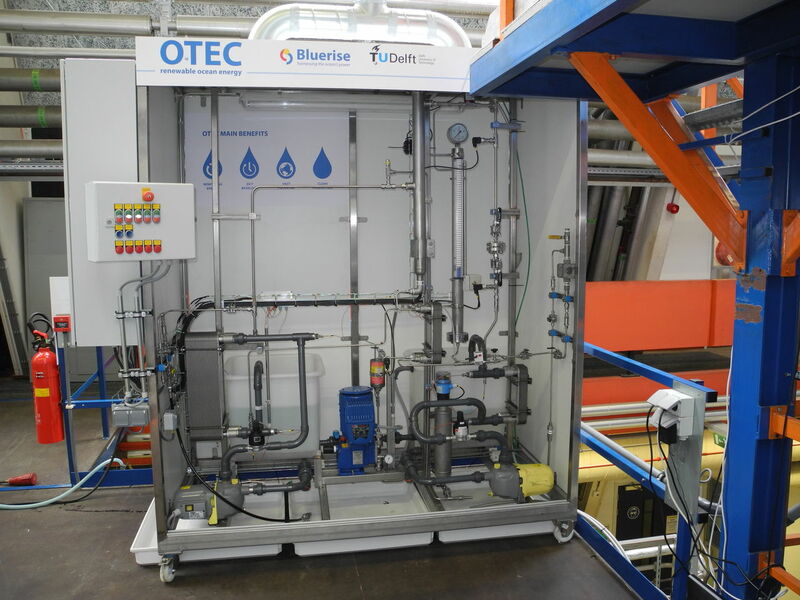 This ‘OTEC demo’ is in use in the laboratory of Process & Energy. One of the crucial components in the thermodynamic cycle of OTEC being studied are the heat exchangers. Large heat exchangers are required to transfer heat from the seawater to the working fluid, both for evaporation and condensation. At the same time, they have to fulfil high expectations with regard to mechanical strength, weight, size, fouling, corrosion and costs. The main objective of this research is to analyze and develop the most suitable heat exchanger design for OTEC. 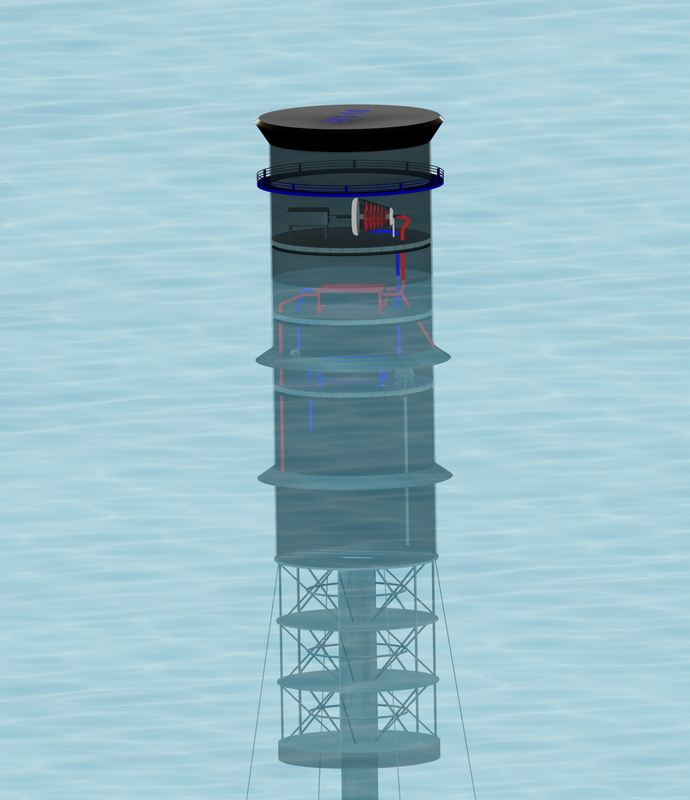 The majority of the OTEC resource is best accesible using offshore floating structures. Key technical challenges under investigation are the dynamic behaviour of the floating structure and the cold water pipe, its interface and the power cable. These offshore systems require detailed research to find technical feasible solutions supported by analytical methods and hydrodynamic modeling of mooring - riser - floating structure configurations. OTEC still is a relatively unexplored renewable energy technology and it will require design and implementation studies to better understand the challenges and risks associated with commercial OTEC facilities. Also, opportunities for a more synergetic use of the ocean thermal energy resource and infrastructure are part of ongoing studies. Last, taking into consideration the unique characteristics of tropical coastal regions the TU Delft analyzes different implementation strategies for OTEC. This is a video of an inspirational lecture on Ocean Thermal Energy featuring Jan War from the Natural Energy Laboratory of Hawaii Authority, the OTEC foundation and Bluerise. Jan War is one of the pioneers in Ocean Thermal Energy and operations manager at NELHA. During the lecture he shares his experience operating Hawaii’s unique Ocean Science & Technology Park.